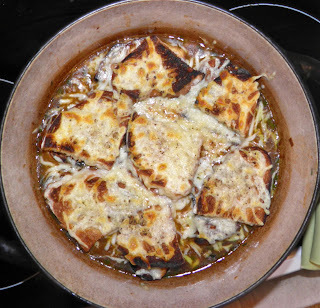 Here’s a recipe that I have been sitting on without making for a very long time. It’s actually one of my favourites. Low 'n slow. That's how to caramelize onions. I’ve been making this from memory for probably about 20 years. I have no idea where the original recipe may have originated. Nor do I care. If memory works in this case like at any other time, this soup is probably not very much like its progenitor. At least now I have written it down so it won't change too much from this point on. And you can make it too! This is a really good "meatless" soup. It does use beef stock. The cheese substitutes for meat a little, as does the bread. So how do you ensure it is a satisfying meal on its own? You have to introduce a lot of flavour. That means using a few basic culinary techniques, plus some good quality ingredients. 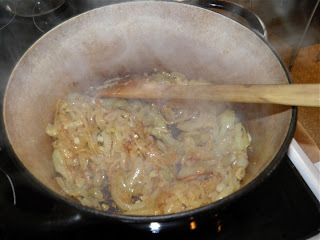 Caramelizing the onions is the first. Caramelizing usually refers to heating sugar to the melting point and a little beyond. You can also do this with vegetables with high natural sugar content. Beets, carrots and onions are three that have a lot of natural sweetness. This is the soup all ready for toast and cheese. Caramelizing their sugars adds depth of flavour. But just like caramelizing cane sugar, you don’t want to burn it. So caramelize on medium heat, slowly. Next up is cooking a little flour with the onions until it takes on a bit of a nutty taste, like the start of a roux. This can be done in a short time (2-3 minutes), and really makes a difference. This adds body to the broth as well. After that it’s really up to your ingredients – good beef stock, fresh herbs, and nice, flavourful cheese. And don’t forget the bread. Traditionally it's a crusty French baguette. I used my homemade whey bread. It was an excellent choice too. Nice and "sturdy." Anyone else hungry? I am. If you combine all these simple ingredients together you really get something wondrous. Fresh from under the broiler, and piping hot. Heat 1/4 cup of the butter in a Dutch oven or other oven-safe pot. Slice the onions, thin but not too thin, and add to the pot. Then chop and add the garlic. Sauté the onions and garlic over medium heat, stirring often. Sauté until they begin to caramelize (turn golden), but are not burnt. 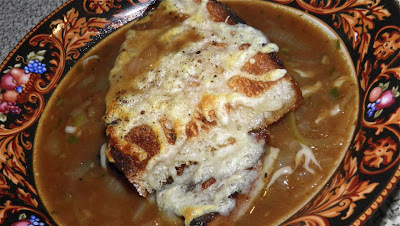 While the onions caramelize, toast the baguette slices and set aside. Add the second 1/4 cup of butter to the pot. After it is melted, sprinkle the onions with 1/4 cup of flour. Mix together well and let the onions cook for a further 2-3 minutes until the flour starts to colour slightly. 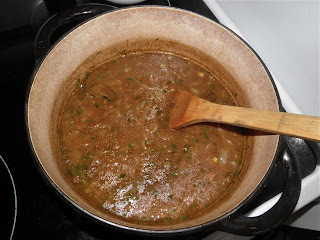 Add the beef broth, sherry, Dijon (if using), tarragon and black pepper. Let the soup come to a boil and then simmer for 5 minutes. Make sure to scrape any brown bits from the bottom of the pot as it simmers. Taste the soup for salt. You may not need any depending on the saltiness of your stock. Adjust the pepper and tarragon at this time as well, if desired. Keep the soup hot. Grate the cheese and set aside. 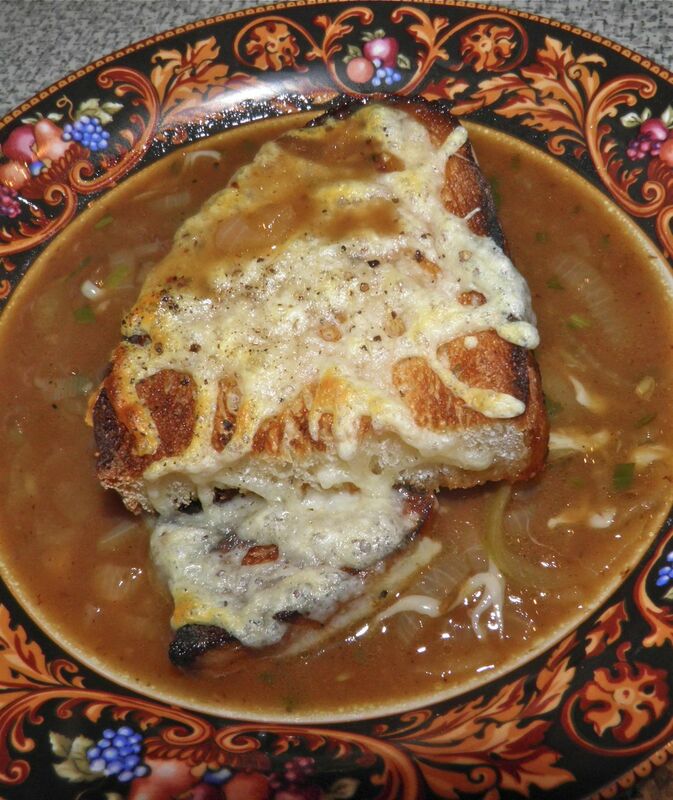 Layer enough toasted baguette to cover the surface of the soup. Sprinkle the toast with 1/2 of the cheese. Add another layer of toast and finally the remaining cheese. If desired, sprinkle the top with a little pepper. Broil the soup until the cheese bubbles. Serve immediately. * You need to have enough toast slices to cover the top of the soup in two layers.